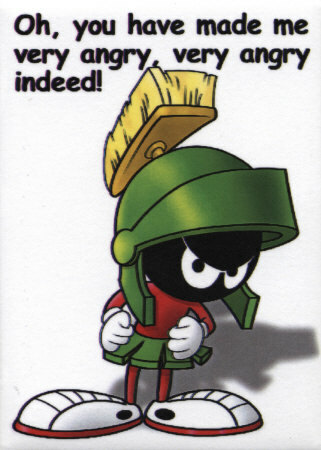 Marvin the Martian is a cartoon character from the Looney Tunes. He first appeared in the cartoon "Haredevil Hare". He is a short, stout martian who is obsessed with either destroying or taking over the Earth. However, Bugs Bunny and Daffy Duck always stop him. He has a powerful laser weapon, the Iiilidium X-3 Modulator, which is powered by martian dynamite known as Illidium. He is often prone to outburst of anger, proclaiming "You are making me very angry! Very angry indeed!". His second-in-command is his alien dog, K-9. he has an army of INstant Martians (who come in pills that morph into they real form when they come in comntact with water). In "Space Jam", he is the referee of the game between the TuneSquad and the Monstars. In the television series "Tiny Toons", we see his niece, Marva. In "Looney Tunes: Back in Action", he is an agent of Mr. Chariman. After escaping from Area 52, he posotions the Blue Monkey Diamond into the satellite weapon that is gonna turn all of humanity into monkeys, but Bugs fights and defeats him while Daffy uses his beak to deviate the laser beam, thus saving the world. In the television series "Duck Dodgers", he plays Martian Commander X-9, based on some old movie serials he did. In the television series "Loonatics Unleashed", we see his great-great-grandson, a Martian conqueror. In the television series "Duck Dodgers", he plays Martian Commander X-9, based on some old movie serials he did. In the television series "Loonatics Unleashed", we see his great-great-grandson, a Martian conqueror.